We have Leon dealers all over the world and our new 'Dealer Spotlight' feature takes a closer look at some of the companies who sell our products to give insight into the Leon products they love and why they enjoy doing business with us. This month we spoke with Dave Cartier from APW Custom Home Theatres in Chatham, Ontario, Canada. Q: Tell us a little bit about APW Custom Home Theatres: How long have you been in business? What type of projects do you typically take on? A: We were founded in 1978 and have been doing custom projects with the same tech staff since 1999. We mainly work on higher-end residential projects, automated home solutions, lighting control, media rooms, and dedicated home theatres. A: Over a decade for sure, likely since 2004-2005. Q: What do you like most about our products? A: We love the custom approach to all products like the ability to make specific changes to a model or design—you're custom to the core! But more importantly, we appreciate the open communication line between the dealer and production. Q: What about your clients? 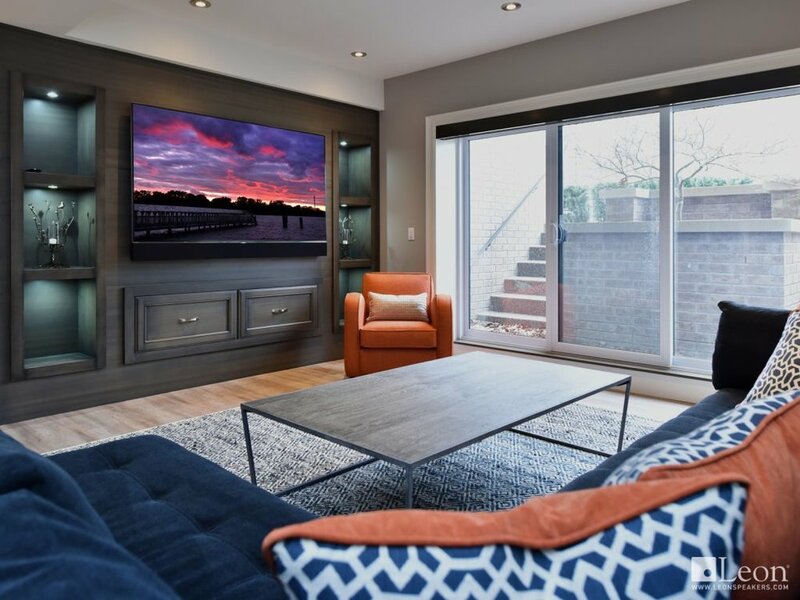 A: Our clients love the final fit and finish, we design our systems to blend into the home design and you help us achieve this with every system we install! Q: You guys often tag us on social in beautiful installation photos, and more times than not, they feature our Profile Series sidemount speakers. What is it about the Profile Series that keeps you specifying them in your projects? A: When the initial site drawings are reviewed, we look at the size of the space to see if we can extend the width of the TV system by using Profiles (MC models usually) to add a nice linear look to a large open wall. They balance the space visually, allowing the client to add a long credenza underneath, or in the case with the new linear fireplaces, the use of Profiles works perfectly for matching the overall width of the fireplace and surround. You can learn more about APW on their website and check out some of our favorite installation images from them below. You can find out more about our Profile Series speakers here. Are you a Leon dealer who'd like to be featured in our Dealer Spotlight? Let us know!